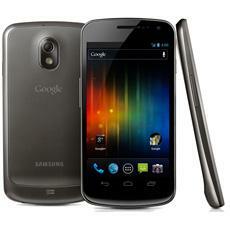 Google and Samsung announced on Wednesday the Galaxy Nexus smartphone, the first device to feature the new Android 4.0 Ice Cream Sandwich release. Unveiled by the two companies in Hong Kong, the new handset will sport a 4.65-inch Super HD AMOLED display with 1280 x 720 resolution, a 1.2 GHz dual-core processor, NFC and a 5-megapixel rear camera. The Galaxy Nexus sports 4G LTE connectivity and an HSPA+ version, depending on the region. Samsung and Google had originally planned a launch event for Oct. 11, just one week after the unveiling of the iPhone 4S. That event, however, was postponed, reportedly out of respect for the death of Apple co-founder Steve Jobs. The Galaxy Nexus is now set to launch in the U.S., Europe and Asia starting in November. Google first teased its Android 4.0 Ice Cream Sandwich update in May. The release is meant to reunite the Honeycomb tablet-specific variant with the smartphone-oriented Gingerbread. The Mountain View, Calif., software company has promised "an entirely new look and feel to Android" with version 4.0. During Wednesday's event, Android mastermind and Google executive Andy Rubin highlighted three defining characteristics of Android: ease of use, beauty, and "beyond smart" cloud capabilities. However, presenters during the event experienced some minor hiccups. 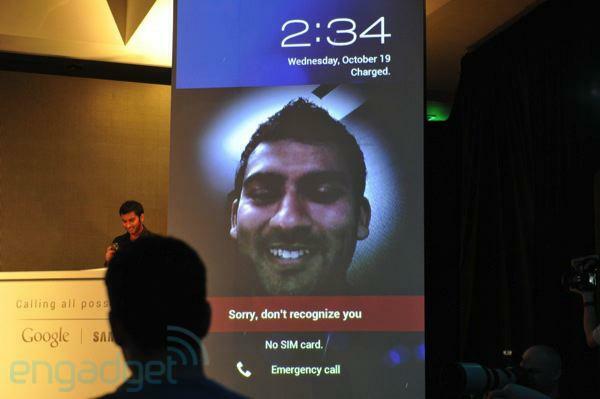 For instance, Android's new "Face Unlock" feature failed to recognize Google's Matias Duarte, as noted by Engadget. Google also demonstrated a new "Android Beam" feature in Ice Cream Sandwich on Wednesday. Android Beam makes use of NFC chips to offer tap-to-share functionality to share information including contact information, webpages, people cards and "a bunch of other things." The software giant plans to quickly release an API to allow developers to take advantage of Beam in their third-party applications. The Galaxy Nexus will serve as one of the first challengers to Apple's just-released iPhone 4S. Apple appears to have an instant hit on its hands, as sales of the device topped four million in the first three days of availability. "In our wildest dreams, we couldn't have got off to a better start than we did with the iPhone 4S," CEO Tim Cook said during an earnings conference call on Tuesday, noting that he is confident that Apple will "set an all-time record for iPhones" in the coming quarter. Apple currently holds the top spot among global smartphone makers, but Samsung comes in as a close second. In addition to being fierce rivals, Apple and Samsung have become locked in an embittered legal dispute. As of late, Apple appears to have gained the upper hand, after back-to-back victories against Samsung in Germany and Australia.